Among the many political philosophies that center on communal affiliation, socialism and nationalism are probably the most relevant in the contemporary era. They are not only viewed as theories, but also considered as modern phenomena that date back to as early as the 16th century. They are not necessarily contradictory to one another; in fact, these philosophies can co-exist even in a single political or national group. They are the same in that they advocate a sense of community. That is nationalism, promoting distinct identification with a solid political and national entity, and socialism, highlighting the importance of communal property with each member of the group partaking in it equitably. What differentiates them from one another, nevertheless, is their economic impact and flexibility or interdependence when combined with other types of political viewpoints. Socialism by definition is an economic and political theory advocating for communal ownership and cooperative management of the means of production and allocation of resources. In this system, production is carried out by a free association of workers to directly maximize use-values, through coordinated planning of investment decisions, distribution of surplus, and the means of production. The system employs a method of compensation based on individual merit or the amount of labor one contributes to society. Socialists consider full socialism as a society no longer based on coercive wage-labor, organized on the basis of relatively equal power. 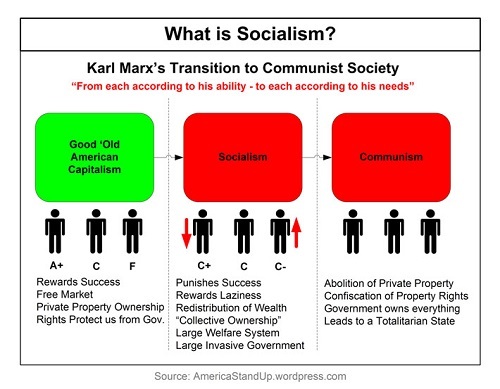 Implementation of a socialist system varies from one sub-set to another. Some socialists advocate complete nationalization of the means of production, distribution, and exchange, while others promote state control of capital within the framework of a market economy. Some have implemented the creation of centrally planned economies directed by a state that owns all the means of production; others have instituted various forms of market socialism, combining co-operative and state ownership models with the free market exchange and free price system. However, more liberal socialist sectors deny governmental control and ownership of the economy altogether, and opt for direct collective ownership of the means of production via co-operative workers’ councils and workplace democracy. 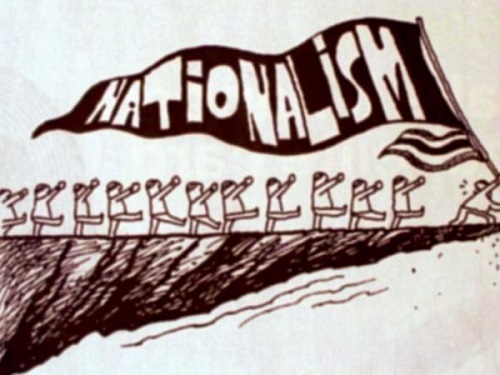 Nationalism, on the other hand, is a socio-political framework that involves a strong identification of a group of individuals with a political entity defined in national terms, or in simpler terms, a nation. It emphasizes collective identity – a ‘people’ must be autonomous, united, and express a single national culture. It maintains that an ethnic group has a right to statehood, that citizenship in a state should be limited to one ethnic group, or that multi-nationality in a single state should necessarily comprise the right to express and exercise national identity, even by minorities. Another one of nationalism’s principal advocacies is that the state is of primary importance. Often, it is identified as a movement to establish or protect a homeland for an ethnic group. Nationalism is concretized not only through portrayal of collective identities towards imagined communities which are not naturally expressed in language, race, or religion, but also through socially constructed policies, laws, and lifestyle preferences by the very individuals that belong to a given nation. Moreover, divergence in some aspects of the framework exists among its advocates. Some nationalists uphold it with a reactionary approach, calling for a return to a national past. Revolutionary variations call for the establishment of an independent state as a homeland for an ethnic minority. 1) Socialism and nationalism are political frameworks that highlight communal affiliation as a key driver to socio-economic sustenance. 2) Socialism advocates communal ownership and equitable distribution of wealth among its co-operative participants. 3) Nationalism promotes solid identification with a political or national entity through socially constructed policies and lifestyle favorable to the ‘nation’ it upholds. Celine. "Difference Between Socialism and Nationalism." DifferenceBetween.net. August 1, 2017 < http://www.differencebetween.net/miscellaneous/politics/difference-between-socialism-and-nationalism/ >.